Is getting traffic from social media a challenge for you? Trying every possible tactic to squeeze more traffic out of sites like Twitter, Google Plus and Facebook. The truth is that one of the most effective ways to generate more traffic from social media is to use LinkedIn. The key is knowing exactly how to use LinkedIn in a way that will bring you more traffic and email subscribers. In this post I will show you exactly how to generate more exposure for your blog using LinkedIn – it’s easier than you think. In February 2014, LinkedIn opened its publishing platform called the Pulse to the general public and will be rolling out access to everyone in the coming months (you’ll see a pencil icon in the share box at the top of your homepage). If you’ve spent any time learning about blog promotion, then you know that guest posting is one of the most popular ways to grow a following on your blog. Publishing on LinkedIn is similar to guest posting and you can now start reaching LinkedIn’s 332 million members. Before we dive into how to use LinkedIn publishing, there are 3 things you should know. 1. Get exposure to LinkedIn’s massive audience – on LinkedIn, you will be able to reach a lot of people that you won’t be able to reach through guest blogging or other social media channels. 2. Short articles can do well on LinkedIn – over 70% of Pulse featured articles are under 1,000 words. Guest posting on popular blogs in contrast often requires longer more detailed articles. 3. 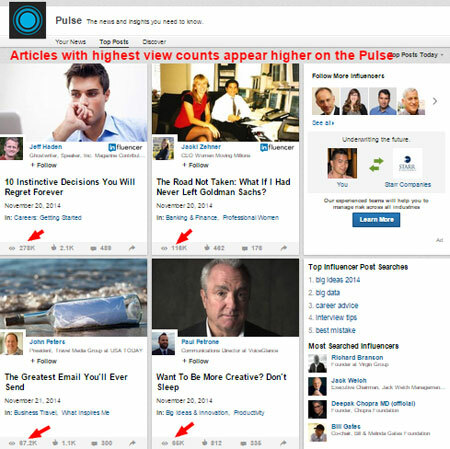 Instant approval – Pulse articles are published instantly when you hit the publish button. With guest blogging, popular blogs will often have a wait time of weeks or even months before your post goes live. Over the summer, I analyzed posts that got featured on the Pulse and experimented with publishing on LinkedIn to drive traffic and new subscribers to my own blog. 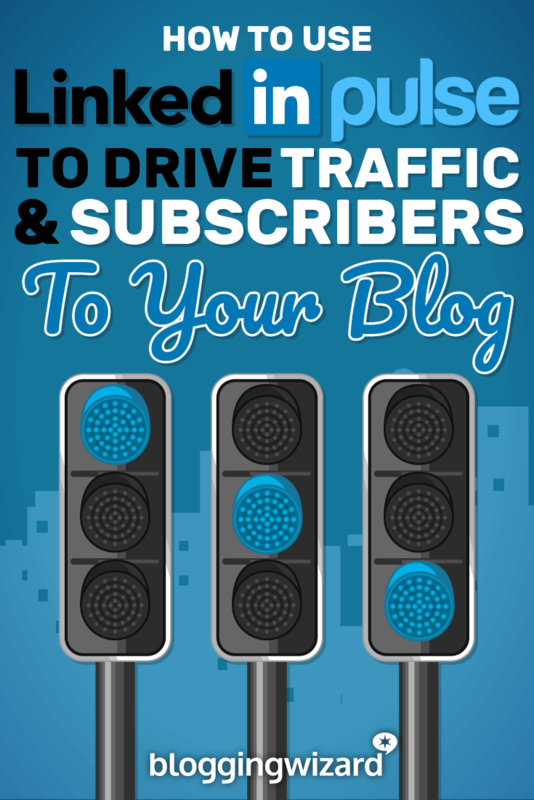 Then check out these tips for getting traffic and subscribers by publishing on LinkedIn. The most popular topics on LinkedIn are careers, business and self improvement. If your blog is about any of these topics, then LinkedIn’s audience could be a natural match for your content. But what if these topics aren’t relevant to your blog or you don’t want to write about them? If your blog is not focused on business or careers, be sure to also check out LinkedIn’s content channels (middle of the page) and see if you can pick a topic that matches up with one of those channels. Some of these channels have over 100,000 followers, so you can still get a lot of exposure if you get featured on these channels, even if you aren’t writing about careers or business. Action Tip #1: Popular topics on LinkedIn include business, careers and self improvement. But if you don’t want to write on those topics, check out LinkedIn’s content channels and try to align your topic to one of those channels. Beginner bloggers often don’t spend much time on their headlines. When writing on LinkedIn, the headline is even more critical, especially if you don’t have a large following. If people click on your post to read it, LinkedIn’s algorithm will display your post to even more people. Furthermore, if other people like, share or comment on your post, this activity will show up on their LinkedIn feed and be visible to all their connections. Johnson Kee was relatively unknown as a writer, but over the summer was able to accumulate over 2,500 followers. Action Tip #2: A clickable headline can allow your post to go viral, even if your article does not get featured on a channel. Write at least 3-4 different headlines and pick the best one for your article. As you write more articles, you should accumulate more followers over time. These followers can increase your article views and engagement, especially if you publish consistently. If you look at other authors that aren’t as well established, you’ll notice that their featured articles can get thousands of views, but the articles that don’t get featured will get noticeably less attention. Spending time growing your following is a great way to increase your mileage with LinkedIn Publishing. Note that anyone you connect with on LinkedIn also becomes a follower by default. Action Tip #3: People with more followers tend to get more article views. So spend time networking and growing your connections and followers on LinkedIn, especially with people who are interested in the topics that you normally write about. If your article makes it into the Pulse, you can push it even higher and get even more exposure to it by promoting it to your email list and social media followers. Note that your article does not even have to be channel featured to show up on the Pulse. 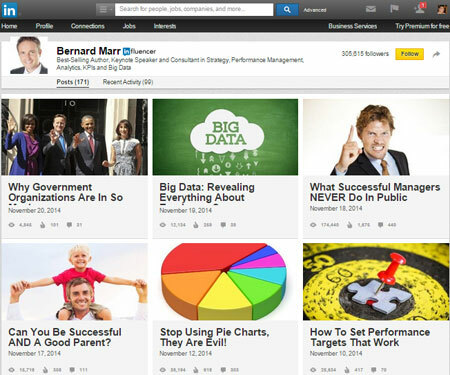 A high view count to your LinkedIn article within a 48 hour time frame is all you need. Action Tip #4: If your post gets featured on the Pulse, you can drive even more views to it by promoting it outside of LinkedIn. The more views your article gets, the higher it will show up on the Pulse, which means even more people will see it. LinkedIn’s editors do a decent job of finding good content, but with the abundance of content being written on LinkedIn, they don’t see everything. Many people don’t know this, but you can actually tweet your post to the LinkedIn editorial team at @LinkedInPulse to make them aware of it. This thread in the Writing for LinkedIn group has more details. You will want to tell them why your post is worthy of being featured instead of just using the article title in the tweet. Then add “Tip @LinkedInPulse” at the end of the tweet. I had one or two articles that weren’t getting much attention within the first couple of hours that I got featured by using this trick. Action Tip #5: If you wrote an article that you think will do well with LinkedIn’s audience and it has not been featured on a content channel within the first couple of hours of publishing, send a tweet to LinkedIn’s editor team for consideration. One final tip that may seem obvious to any experienced blogger. Be sure to link out to an email capture page at the end of your article. Surprisingly, only 37.67% of LinkedIn articles on the Pulse linked out to the author’s website and most of those that did add a link only to their home page. 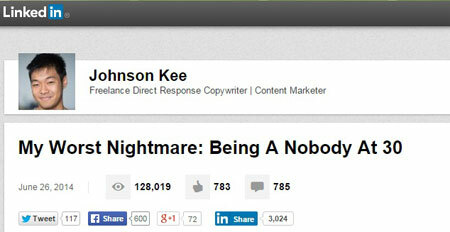 Some of my better LinkedIn articles have gotten me just as many subscribers as guest posts, but with less work. Brian Lang is the owner of Small Business Ideas Blog, where he shares tips and ideas about online marketing and running a small business. Brian has over 10 years of experience from running his own e-commerce stores and Web Developers Etc, a web design and marketing company. 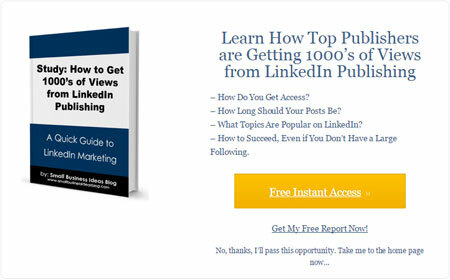 If you want to learn more about marketing on LinkedIn, be sure to download a free copy of his 16 page study, How Top Publishers are Getting 1000's of Views from LinkedIn Publishing.